The Melbourne Cricket ground, or MCG, is not just the biggest Australian sports venue, but the icon for Melbournes love of sport. The G, as locals call it, was the centrepiece of the opening and closing ceremonies and athletics events in the 1956 Olympics, and the 2006 Commonwealth Games. It also hosts, among many sporting event throughout the year, the AFL Finals and Cricket Tests. The MCG is massive  it looks like a big tyre - and is visible from many directions. 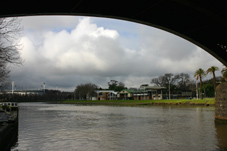 It is located next to the Yarra, walking distance from the city along the picturesque Birrarung Marr. It has even made it into the Victorian and Australian Heritage Register. 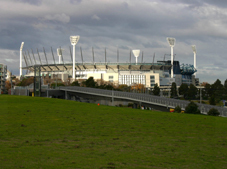 As the name suggests the MCG began with cricket - the Melbourne Cricket Club selected the current site in 1853. Its first wooden members grandstand was built a year later, but as early as 1861 a 2000 seater public grandstand was added to the viewing experience. At that time, the MCG was strictly used for cricket only. In the decades around the turn of the century more stands were built, wooden ones gradually replaced with brick stands - making the MCG into the round wheel shape that it is today. It was upgraded again for the 2006 Commonwealth games, now with stands and spectator roofs covering the whole oval. The list of events in the Melbourne Cricket Ground is long. There is the annual Boxing Day Cricket Test Match. This is an international event with sell out crowds of around 90,000. It began in 1866 with an Indigenous Australian Cricket team playing the MCG team in front of 11,000 spectators. But its not the Cricket that dominates the MCG, but AFL football. This is Melbournes most popular sport and its spectator numbers are larger than for any other Australian sport. In the late 1800s, the Australian Football League games became regular events at the Melbourne Cricket Ground. The fist official game of the Victorian/Australian Football League was played in 1897. At that time the MCG was the home ground for the Melbourne Football Club. Today, it is also the home ground for Richmond, Collingwood and Hawthorn. Since 1902, the AFL Grand Finals have been played at the MCG. This is the Australian Sporting event of the year and draws record crowds. The largest was in 1970 with 121,696. Today there is no longer any standing room, reducing the maximum number of spectators to around 90,000. Other events that have happened at the G are various rock concerts with performers such as David Cassidy and David Bowie in the 1970s, and Paul McCartney, U2, Madonna, The Rolling Stones, Michael Jackson and Elton John in the 1990s, and the Police in 2008. Pope John Paul II held a service in 1986 at the MCG. But the largest crowd to ever (130,000) gather at the Melbourne Cricket Ground was to see the religious leader Billy Graham in 1959. The National Sports museum has recently opened in the Melbourne Cricket Ground. It houses the most comprehensive collection of sporting artefacts and items and multi media displays. The museum houses the Sport Australia Hall of Fame, the Australian Gallery of Sport and Olympic Museum, the Australian Cricket Hall of Fame, the Aussie Rules Exhibition, as well as various current events. To get a view behind the scenes of the MCG, you can take part in a Melbourne Sports Tour . Some tours even give you the opportunity to watch an Aussie Rules Football match with a local host. 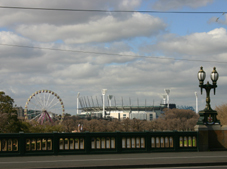 The Melbourne Cricket Ground is a national icon, and the heart of the sporting life of Melbourne.